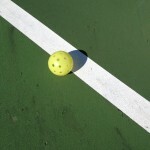 Are you registered to be a part of the world record attempt at holding the world’s biggest pickleball tournament? It happens every year about this time. 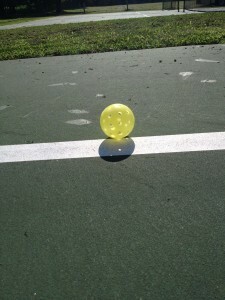 Our whole “Pickleball Rocks” team is registered and ready to play. Plus we just sent in our yearly signed contract to sponsor it. This year’s USAPA National Tournament in Buckeye, Arizona promises to be the biggest and best yet. 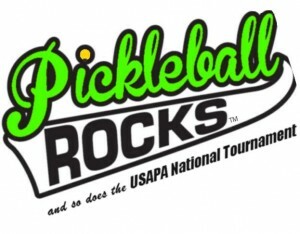 The 2014 USAPA National tournament will be held November 2-9 at Sun City Festival in Buckeye, Arizona. If you haven’t registered yet, the deadline is October 5th. It will be fun to see all our old friends and make a ton of new ones. Hope you’ll join us there. I promise you’ll have a good time. In an officiated match, when should the referee overrule a call made by the players? let us start by saying THANK YOU! To us, one of the top things that help make a great tournament (besides lots of players) are the referees. A shortage of available refs is death to running a smooth, on-time event. But when you are refereeing, what can make your life easier? It is knowing when or when NOT to overrule a player’s call. First, understand that this is the player’s match and they should be in control of it. Not the referee. A referee only has a few responsibilities when on the court. Number one is to keep track of the score and make sure players are in their proper serving and receiving spots (but only when asked). Number two is to watch the non-volley line for foot faults, and number three is to watch for service foot faults. Contrary to what a lot of players think, it is NOT the responsibility of the referee to make line calls, or even to overturn bad line calls. Players are responsible for making their own line calls. To be even more specific, the receiving team is responsible for the line calls when the ball comes to them. Now is the moment when good referees become great, respected referees. If you clearly, and I mean 1000% ,saw that the ball was IN, then you may overrule the call. But you should only make that overrule if you clearly saw the ball hit directly on or inside the line. And most of the time you can only CLEARLY see that on the side of the court you are standing on. If you did NOT clearly see it, then it is absolutely and most of the time expected for you to say, “I did not get a clear enough view to overturn that call”. Two of the players will be miffed for a minute, but it is the proper and respected thing to do. However, if you overrule a call from clear across the court, that was very close, then two players are going to be mad and they will doubt whether you or anyone else could have clearly seen it from that far away. And they have a right to doubt. So be very, very careful about overruling a call that is far away from you. Remember, you have a lot going on during a point to make sure the kitchen stays clean, so if you don’t see a close called ball, it is more than ok.
Don’t ever be afraid to say, “I didn’t get a good enough look”. In the end, players will always respect that and you will be a great referee.